It is a busy week for launches here at The Lilliput Press. 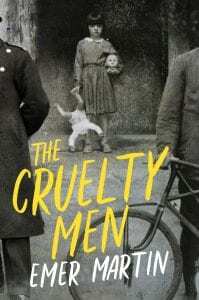 On Thursday 14th June we have the launch of The Cruelty Men by Emer Martin in Hodges Figgis at 6. Emer’s book is a sweeping, multi-generational family saga which follows the psychic and physical displacement of a society in freefall after independence. Abandoned by their parents when they resettle in Meath, Mary O’Conaill faces the task of raising her younger siblings alone. Padraig disappears, Seán joins the Christian Brothers, Bridget escapes and her brother Seamus inherits the farm. Maeve pregnant and unwed, is placed in a Magdalene Laundry where her twins are forcibly removed. The Cruelty Men tells an unsentimental tale of survival in a country proclaimed as independent but subjugated by silence. On Friday 15th June we have our Bloomsday celebrations here in the Lilliput Press on Sitric Road in Stoneybatter. The event will begin at 6 with a Burgundy and Gorgonzola reception. Then at 7 we have Sam Coll, the author of The Abode of Fancy doing a reading. Followed by the launch of The Mooske and the Gripes as illustrated by Thomas McNally. The evening will end with an entertaining Joycean performance by Racker Donnelly. We would love for you to join us at these great events.